The Core Practice Model is a deeper way to work with families to improve safety and outcomes for children. It helps children and families build supportive teams that enable them to identify their strengths and underlying needs in a trusting, positive environment. These insights become the foundation of more effective action plans for change that are tailored specifically to each child and family and rooted in strong community support. 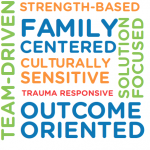 An evolution of our current practice, the Core Practice Model Prioritizes Child Safety while emphasizing strengths over deficits, underlying needs over behaviors, and empowerment over helplessness. For social workers and other staff, the Core Practice Model helps Build Trust with children and families and enables stronger teamwork. For children and families, it creates the Opportunity to be Heard and Empowered that is grounded in strong community support. If implemented with fidelity, this approach is designed to improve child safety and permanency and provide Hope for Healing and Recovery.